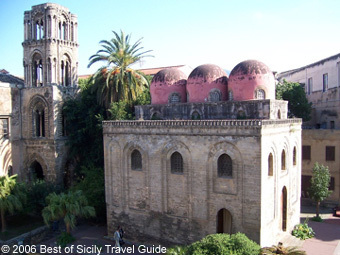 Churches in Palermo - See Palermo and Western Sicily. In this list we've divided some of the city's better-known churches into architectural categories. All these churches are in the old historic part of Palermo and all are normally open to the public unless otherwise indicated. Hours are normally 9-12:30 and then from 4 to 7 PM. 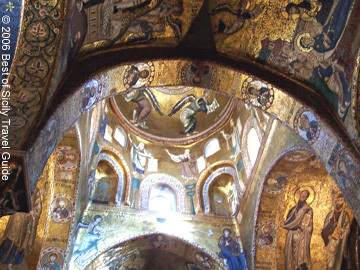 Monreale Abbey: Overlooking the city, this cathedral, abbey and cloister are described on a separate page. The Cathedral of Palermo is also described on a separate page. Martorana: Saint Mary's of the Admiral (shown at right) is its official name. This church was built in 1143 at the behest of George of Antioch, who was a famous Admiral during the reign of King Roger II. George of Antioch was also responsible for the construction of the "Admiral's Bridge." Admiral George's official title was the Arabic "Amir-al-Bahr" or "Emir of the Sea." (Both the Italian "ammiraglio" and the English "admiral" are derived from this medieval Arabic title.) Arabic lettering is visible around the cupola. The church, which was Greek Orthodox during the Norman era, was "converted" to the Roman Rite in the 13th century. It became part of the Byzantine Catholic diocese of Piana degli Albanesi in 1935. The Martorana's original Norman Arab construction was unfortunately altered in the 17th century . The main nave and a good part of the mosaics were torn down and replaced with Baroque construction and frescoes. St John of the Hermits Monastery: Located near the Royal Palace, the Abbey Church of St. John of the Hermits (San Giovanni degli Eremiti) is another fine example of 12th century Norman-Arab construction here in Palermo. That it was built upon a mosque may account for its particularly Arabic style, with five reddish cupolas. (Incidentally, we do not know for certain whether these cupolas were originally red.) The bell tower is the only part of the building that has a distinctively Norman appearance, with its Gothic lines and mullioned windows. Were it not for the bell tower, Saint John's could easily be mistaken for a mosque. Magione Basilica: In the Kalsa quarter of the city, a few steps from the central train station and a busy street named for Abraham Lincoln, stands the Basilica of the Holy Trinity, usually called "the Magione." Construction of this splendid church was begun around 1170 under the direction of Matthew Aiello, a chancellor of the King. It initially served as a monastery of the Cistercians, whose cloister still stands next to the church. As King of Sicily, Henry VI von Hohenstaufen (ruled 1194-1197) confiscated the complex and erected a commandery of the Teutonic Order, which established it as their conventual seat for western Sicily. The presence of the Teutonic Knights reflected Henry's attempt to bring a German influence to the Sicilian court. His premature death changed this, but the Teutonic knights remained until the fifteenth century. In 1787, King Ferdinando of I of the Two Sicilies made the church part of the royal demesne as a commandery of the Constantinian Order of Saint George, whose cross appears over the portal at the entrance to the courtyard. The Constantinian Order still uses the Magione for some of its services. The church's style contrasts somewhat with that of the other Norman-Arab churches in Palermo. With its sweeping arches, the Magione embodies a more typically Northern European style clearly influenced by the early Gothic. It has a transept, pointed roof, and no tower or cupolas. The Magione was built before the vogue for rose windows (such as those in the "Romanesque Gothic" churches of Saint Francis and Saint Agostino described below), while the exterior design of the church's apse is similar to that of the cathedrals of Palermo and Monreale. St Francis Assisi: The Basilica of San Francesco d' Assisi (St. Francis of Assisi) is a splendid medieval church erected in the typically Italian Romanesque Gothic style. Construction was begun in 1255 by the Franciscan Order, which still has a monastery here. The portal is noted for its richly decorated triple false arches, while the exquisite rose window above the main entrance is the epitomizes medieval Latin church architecture. The facade, built in the early 1300s by the Ventimiglia, Abbatelli and Chiaramonte families, is not unlike that of the Church of Sant' Agostino, but inside St. Francis retains a much more medieval flavor. The church has a nave with magnificent arches, and also a beautiful cloister. A side chapel is dedicated to the Sicilian branch of the Grimaldi family, better known in Genoa and Monaco. St Augustine (Sant'Agostino): The Church of Sant' Agostino (St. Augustine), on Via Francesco Raimondi, was built in the fourteenth century in a Romanesque Gothic architectural style that is locally known as "Chiaramonte Gothic." The construction of the church was financed mostly by a powerful Sicilian baronial family, the La Grua, whose coat of arms is visible on the exterior. Most of the interior was reconstructed in the Baroque style in later centuries. The facade, rose window and main entrance are typically medieval, as is the cloister off to the left side of the church. Santa Maria della Catena: The Church of Santa Maria della Catena (St. Mary's of the Chain) takes its name from the huge chain that was strung across the water here to bar entrance to the "Cala," the interior part of Palermo's harbor. This practice originated during the Middle Ages, when raids by Turkish corsairs and other assorted pirates were not uncommon. Casa Professa: The "Chiesa del Gesù" (Church of Jesus), also known as Casa Professa is Baroque masterpiece located in Palermo's Alberghieria quarter near the Quattro Canti. The Jesuits built the original church here, the Order's first one in Palermo, between 1564 and 1578. Afterwards, the Church was enlarged with the addition of side chapels and further decorated in the Baroque manner. When it was finally completed in 1634, the Church was Palermo's most ornate Baroque church, and still is. Saint Joseph of the Theatines and Quattro Canti: San Giuseppe dei Teatini is the large church located on the southeast corner of the Quattro Canti. It is the ultimate in Baroque. The church was designed by Giacomo Besio in 1612. The Dome was added in the 18th century. One of the more noted works of art in this Baroque jungle is "The Triumph of Sant' Andrea Avellino" painted in 1724 by the Dutch artist Borremans. Saint Dominic: The Basilica of San Domenico (St. Dominic), off Via Roma, is another fine example of Sicilian Baroque and is also known for the many prominent Sicilians laid to rest in it. San Domenico's landmark is the obelisk-like "Colonna dell' Immacolata" in the piazza in front of the basilica. The church is noted for its facade, designed and built in 1726 by Tommaso Maria Napoli. The inside of the Church is not particularly interesting, except for the tombs of several Sicilians of national prominence. Francesco Crispi, the first prime minister of a united Italy, is buried here. The church is also the final resting place of folk scholar Giuseppe Pitré, and artist Pietro Novelli.